1.Let's Do It (Let's Fall In Love)02:01 (Cole Porter - Cole Porter) Peggy Lee. 2.I've Got You Under My Skin03:37 (Cole Porter - Cole Porter) Frank Sinatra. assets/extraits/369682/FR14F1001190.mp3 3.My Heart Belongs To Daddy02:59 (Cole Porter - Cole Porter) Eartha Kitt. assets/extraits/369682/FR14F5600630.mp3 4.Too Darn Hot03:47 (Cole Porter - Cole Porter) Ella Fitzgerald. 5.I've Got You Under My Skin02:35 (Cole Porter - Cole Porter) The M.G.M. Studio Orchestra. 6.From This Moment On02:32 (Cole Porter - Cole Porter) Ann Miller. 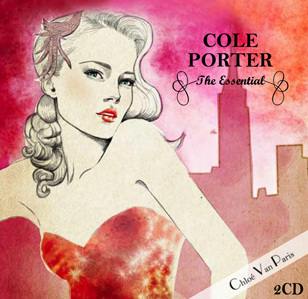 7.I Love Paris04:56 (Cole Porter - Cole Porter) Ella Fitzgerald. assets/extraits/369682/FR14F5400910.mp3 8.Just One Of Those Things03:12 (Cole Porter - Cole Porter) Frank Sinatra. 9.Begin The Beguine03:49 (Cole Porter - Cole Porter) Art Tatum. 10.In The Still Of The Night02:37 (Cole Porter - Cole Porter) Ella Fitzgerald. assets/extraits/369682/FR14F5000070.mp3 11.Easy To Love03:27 (Cole Porter - Cole Porter) Charlie Parker. 12.Night And Day02:59 (Cole Porter - Cole Porter) Billie Holiday. 13.You Do Something To me02:20 (Cole Porter - Cole Porter) Ella Fitzgerald. 14.Begin The Beguine03:11 (Cole Porter - Cole Porter) Artie Shaw & His Orchestra. 15.Let's Do It (Let's Fall In Love)02:53 (Cole Porter - Cole Porter) Mary Martin. assets/extraits/369682/FR14F4500480.mp3 16.What Is This Thing Called Love03:04 (Cole Porter - Cole Porter) Billie Holiday. assets/extraits/369682/FR14F4700570.mp3 17.Love For Sale02:46 (Cole Porter - Cole Porter) Erroll Garner. 18.Miss Otis Regrets03:04 (Cole Porter - Cole Porter) Ella Fitzgerald. assets/extraits/369682/FR14F5600600.mp3 1.Let's Do It (Let's Fall In Love)03:30 (Cole Porter - Cole Porter) Ella Fitzgerald. 2.Night And Day03:40 (Cole Porter - Cole Porter) Frank Sinatra. 3.Easy To Love02:58 (Cole Porter - Cole Porter) Billie Holiday. assets/extraits/369682/FR14F5500070.mp3 4.You'd Be So Nice To Come Home To03:34 (Cole Porter - Cole Porter) Cannonball Adderley. 5.Begin The Beguine03:36 (Cole Porter - Cole Porter) Ella Fitzgerald. 6.Love For Sale02:57 (Cole Porter - Cole Porter) Billie Holiday. assets/extraits/369682/FR14F4100020.mp3 7.What Is This Thing Called Love03:30 (Cole Porter - Cole Porter) Sidney Bechet. 8.Just One Of Those Things01:19 (Cole Porter - Cole Porter) Lena Horne. 9.What Is This Thing Called Love02:32 (Cole Porter - Cole Porter) Mary Martin. assets/extraits/369682/FR14F5300110.mp3 10.Easy To Love02:54 (Cole Porter - Cole Porter) Chet Baker. 11.Looking At You02:13 (Cole Porter - Cole Porter) Lee Wiley. assets/extraits/369682/FR14F4400440.mp3 12.Don't Fence Me In03:03 (Cole Porter - Cole Porter) The Andrews Sisters & Bing Crosby. 13.Just One Of Those Things02:47 (Cole Porter - Cole Porter) Django Reinhardt. 14.In The Still Of The Night01:57 (Cole Porter - Cole Porter) Al Bowlly. 15.Begin The Beguine04:37 (Cole Porter - Cole Porter) Erroll Garner. 16.All Through The Night03:13 (Cole Porter - Cole Porter) Ella Fitzgerald. assets/extraits/369682/FR14F1001280.mp3 17.You're The Top03:16 (Cole Porter - Cole Porter) Hal Kemp. 18.Anything Goes04:02 (Cole Porter - Cole Porter) Erroll Garner.